Welcome to our page with helpful information on your cruise terminal nearest airport. We hope that you will find this page useful. Cruise passengers who sail out of the Manhattan Cruise Terminal have three area airports from which to choose: La Guardia Airport (LGA), New York; John F Kennedy International (JFK), New York; and Newark Liberty Airport (EWR), New Jersey. It is located a few blocks west of Times Square. The port's location puts it about 12 miles from La Guardia, 15 miles from Newark and 20 miles from JFK. The most economical means of transportation from either one of the three airports is by taxi. Note that in addition to the metered fare, you will be responsible for any toll paid along the way plus tips. La Guardia will give you the shortest ride and the lowest fare. You may be interested in New York City Hotels. 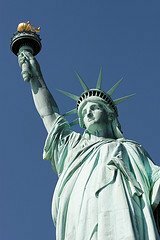 Similarly to getting to the New York Cruise Terminal, your family may choose to fly into one of 3 area airports to sail out of Cape Liberty, Bayonne, New Jersey: La Guardia, NYC (LGA); John F. Kennedy International, NYC (JFK); or Newark Liberty International, NJ (EWR). The Cape Liberty Cruise Port address is: 14 Port Terminal Boulevard, Bayonne, NJ 07002-5038. The fastest way to get to the Cape Liberty Port from Newark Liberty is by taxi or shared-shuttle service. At the time of writing this, taxi service is going at $35 one way, while shared-shuttle is costing about $30 per person. Taxi service is your best choice. Note that you will pay more if traveling from LGA or JFK. Please check all costs before leaving home. Ignore offers of transportation from solicitors in the terminal. Go to ground transportation information counters, bus stops and taxi dispatchers for safe and legitimate transportation. Ignore non-uniformed people offering to assist with baggage. Seek out uniformed porters or airline employees for baggage assistance. You are now directly across Route 440 from The Peninsula at Bayonne Harbor, which includes the Cape Liberty Cruise Port. Call one of the three Bayonne cab companies to drive you to the cruise port, which is about two miles east of the Light Rail line. From the Port Authority Bus Terminal, take the 99S bus to Bayonne. The 99S bus travels along Kennedy Boulevard into Bayonne and stops on request every three blocks. When you reach 33rd Street and Kennedy Boulevard in Bayonne, you will be at the closest point on the bus route to the cruise port. Call one of the three Bayonne cab companies to drive you to the cruise port, which is about three miles east of Kennedy Boulevard. The Baltimore Cruise Terminal Address is: 2001 E McComas Street, Baltimore, Maryland. The fastest and cheapest way to get from BWI to the Baltimore Cruise Terminal is by taxi. If your family numbers three or four people with probably one piece of luggage each, then this is the way to go. Follow the signs for "Ground Transportation" after you clear Baggage Claim at the airport. If your family numbers more than four and has several pieces of luggage, you should choose the airport shuttle service. The Norfolk Cruise Port Address is: 1 Waterside Drive, Norfolk, VA. The Norfolk Airport is about 10 miles from the cruise terminal and the ride should take about 20 minutes – without traffic. The most economical way for your family to get from the Norfolk Airport to the cruise port is by taxi. At the time of writing this page, taxi fares were costing about $18 - $25. For additional information on ground transportation from the Norfolk International Airport, visit their website. You may also consider using a shuttle service. Call ahead and check prices. Reservations are not required. Call Airport Connection toll-free at 866-823-4626. The Charleston Cruise Terminal address is: 196 Concord Street, Charleston, SC 29401. Travel Time from the Charleston International Airport to the cruise terminal is about 20 minutes. Your family may elect to use the airport shuttle service which will cost about $12/ person) or taxi service. For taxi service from CHS, the fare is about $27 for the first 2 people. Each additional person pays $12 each. Follow the signs for "Ground Transportation" when you leave Baggage Claim. The Jacksonville Cruise Terminal Address is: 9810 August Drive, Jacksonville, FL 32226. 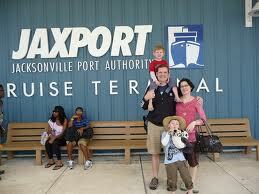 The easiest and fastest way to get to the Jacksonville Cruise Terminal from the airport is by taxi. Gator City Taxi is the official taxi company serving Jacksonville International Airport. Service is available at the entrance to JIA, or call Gator City Taxi at (904) 741-0008 or (904) 355-8294. 2. Bon Voyage Car Service and Shuttle______(904) 233-4547 or their website. You may be interested in Jacksonville Hotels. The nearest airport to Port Canaveral Cruise Terminals is the Melbourne International Airport (MLB), located 26 miles away. 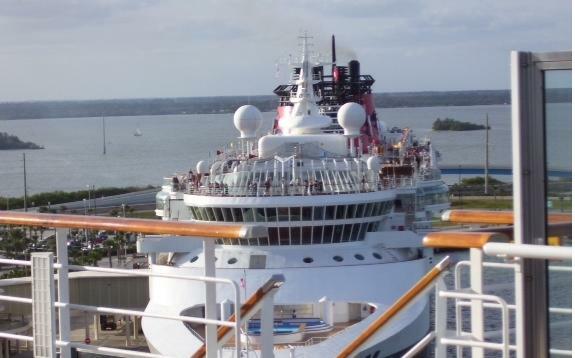 However, most people sailing out of Port Canaveral fly into Orlando International Airport (MCO) – 42 miles away. Orlando offers more direct and nonstop domestic and international flights. 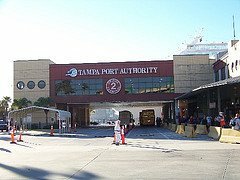 Port Canaveral Cruise Terminal Address: Terminal #2 - 180 Christopher Columbus Drive, Cape Canaveral, FL 32920. Most cruise lines offer airport to cruise terminal transfers, so check with your respective cruise line first. Alternately, you may choose taxi or shuttle service to get to Port Canaveral. Expect to pay a hefty price due to the distance. For taxi or shuttle service, you may visit the Airport’s local transportation page. The nearest airport to Port Everglades (Ft. Lauderdale) is the Fort Lauderdale-Hollywood International Airport (FLL), which is less than 15 minutes from the cruise terminal. Port Everglades Cruise Port Address is: 1850 Eller Drive, Fort Lauderdale, FL 33316. The fact that Port Everglades is just 5 miles from the Ft. Lauderdale Airport makes it easier to find reasonably priced transportation to the cruise terminal. 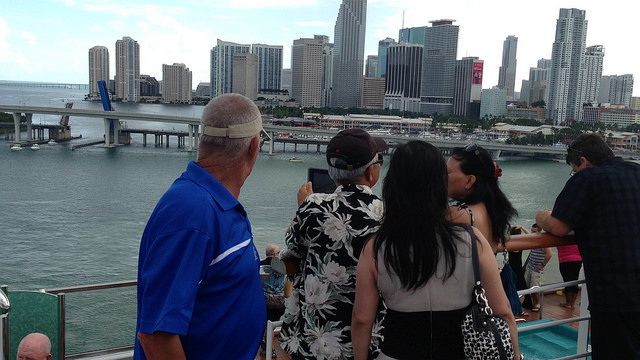 Cruise passengers can choose to use public transportation, taxi service or shuttle service. One viable option for getting around is the Fort Lauderdale Shuttle. They offer 1 way service from the Fort Lauderdale Airport or surrounding hotels to Port Everglades Cruise Terminals. 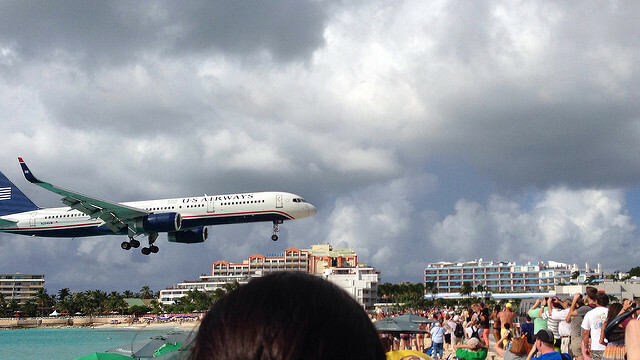 The nearest airport to the Miami Cruise Terminal is the Miami International Airport, which is about 8 miles away. Miami Cruise Terminal Address is: 1015 N America Way, Miami, FL 33132. 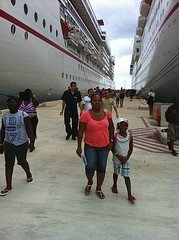 There are two major options to choose from to get to the cruise terminal and each is quite economical. It will cost about $24 per trip (1 - 5 passengers) to get to the port. This may be the cheapest way to get to your cruise terminal from the Miami International Airport. Shuttle service (generally carrying several passengers) will cost about $14 per person. You may also click here to Miami Beach Hotels. Tampa Cruise Port Address is: 651 Channelside Drive, Pier #2, Tampa, FL 33602. 1. Shared Shuttle Service - Super Shuttle - (800) 282-6817 or (727) 572-1111 - Call for pricing! You may be interested in Tampa Hotels. The New Orleans Cruise Terminal nearest airport is the Louis Armstrong New Orleans International Airport (MSY), which is about 17 miles or 45 minutes from the cruise terminal. 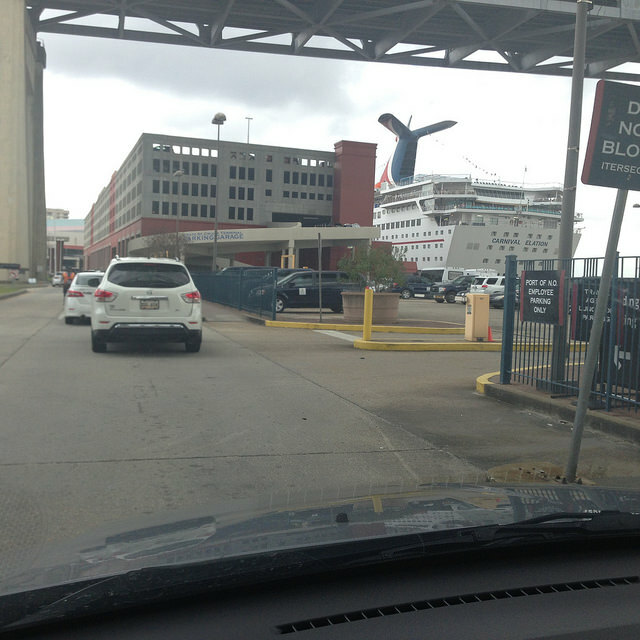 New Orleans Cruise Port Address is: 1350 Port of New Orleans Place, New Orleans, LA 70123. 3. Airport Limousines with rates starting at $58 for one or two passengers. Their phone number is (504) 305-2450. You may also book at Kiosks in the baggage area of the airport. Galveston Cruise Terminal nearest airport is the William P. Hobby International Airport (HOU - Houston Hobby Airport), which is about 42 miles from the Port of Galveston. 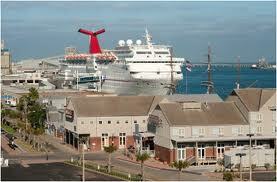 Galveston Cruise Port Address is: 123 25th Street, Galveston, TX 77550. 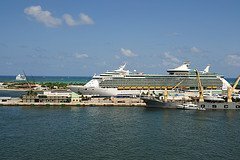 The quickest and most economical means of transportation from Houston Hobby International Airport to the Galveston cruise port is by taxi. Taxis can be found outside "Baggage Claim" at the airport. Note that you can also find private shuttle service to the cruise terminal. 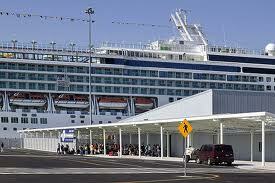 You may also book airport to cruise port transfers with your cruise line. Yes, this is a mouthful, but we hope that you will find it useful. Use it to find your cruise terminal nearest airport.